I had the most wonderful treat this week because I saw, on several occasions, a beautiful bullfinch in the garden. This is the first time I have ever seen one and it was so stunning it literally took my breath away. 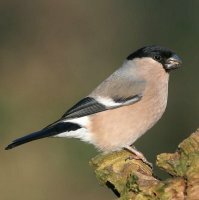 The adult male bullfinch has a bright pink underpart and a black head and although it is seen in gardens, it is more commonly associated with scrub and woodland. Unfortunately bullfinch populations have declined by 36% since 1967. It is typically seen in fewer than 10% of gardens in any week preferring rural gardens connected to small woodlands. 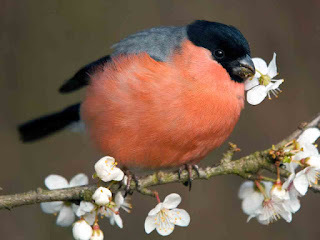 The bullfinch feeds on seeds and shoots of fruit trees and sometimes, in summer, on insects. However during the spring the bullfinch can sometimes be considered a pest species as they feed on and damage the buds of fruiting trees, such as the cherry. In Victorian times the bullfinch was a desired captive bird because of its beautiful plumage and call. It is believed that the caged bird could be trained to mimic music and it became a popular pastime to play a special flute to the bird. The female bullfinch has a much lighter colour and I think it looks a bit like a chaffinch.